“I would be grateful if you stayed away from the Viscount d’Arque,” Godric said as he led his wife onto the dance floor. He mentally winced at his own stiff tone, but in this matter he could not seem to see reason. She was his wife and he’d damn well not take her straying lying down. The music began, the movement of the dance drawing them apart before he could explain further. Godric inhaled deeply as he paced, trying to subdue the incredible wrath that had overtaken him at the sight of Margaret with d’Arque. “What way do you mean?” she asked carefully. Too carefully. For a second her eyes flashed with wild hurt before she could shield the emotion, and he realized he’d just dug himself into a hole. “You think I’m a whore,” she said. But she whirled away, caught in the steps of the dance. This time he watched her anxiously, this wife he knew so little about. Had Clara ever thought she’d been so grievously insulted, she would’ve wept. Or perhaps stomped off. He truly didn’t know because he never would’ve gotten into a discussion like this in the first place with Clara. The very idea was ludicrous. Margaret in contrast held her head high, her cheeks flagged with a becoming rose color. She looked like a goddess enraged. A goddess who might, if they were alone, assault his person—the thought of which unaccountably aroused him. When the dance brought them together again, they both opened their mouths at once. “I never meant—” he began. He hesitated a fraction of a breath too long. They were drawing stares, but he couldn’t let this bit of outrageousness pass. “And now you’re on your second,” she flung back. A childish retort, but also deeply annoying, as she managed to get it off just before they were forced to separate. Which, naturally, gave her the last word. Win the whole Maiden Lane series, 5 books!! 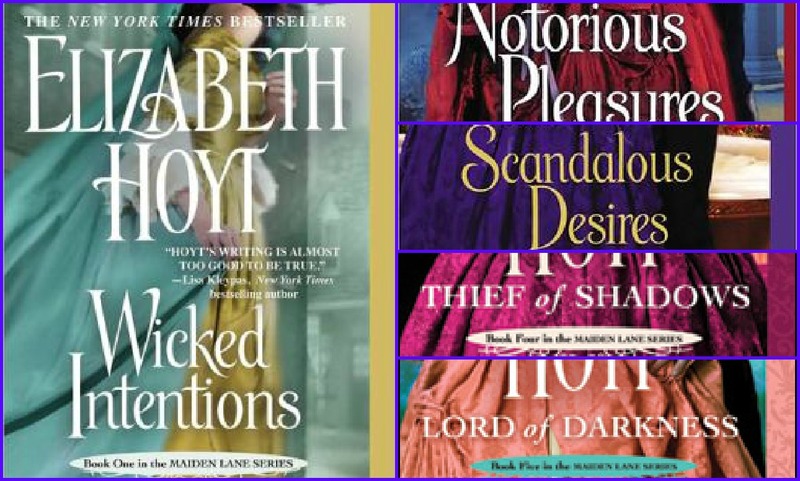 I've been a fan of Elizabeth's books since the Legend of the Four Soldiers series. I read the latest book and then had to go back and read the entire series. Excellent historical romance! I remember Wicked Intentions, but seem to have fallen behind! The new one looks good! She is such a great author! I have missed her last few books though, and I would love the chance to read them! Thank you! I love her books, and I'd really like to read this series. Thanks for the chance to win it. Haven't read this author's books. They sound interesting. I love historical romance, and these sound great. Thanks for the giveaway! I LOVED Lord of Darkness! Such a good one - but oddly enough, I haven't read the previous ones! Thank you for the giveaway!